2017 with all its possibilities lies ahead of us. And while the media prepares for the inauguration of Donald Trump, the Golden Globes and the SAG Awards in January, we want to take a look back at the publishers’ performance in the USA in 2016. We will first take a look at the top players in Google News. After that we will analyze the field in the Google News Boxes for desktop. The third tier will be the best publishers in the AMP Carousels. 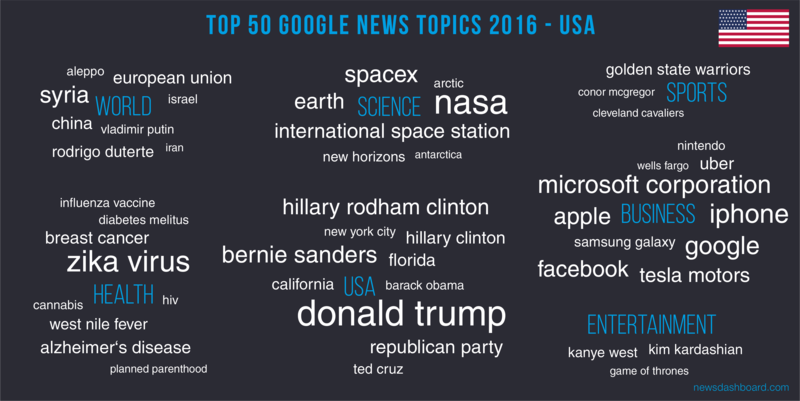 For the grand finale we want to present to you the top 50 Google News topics in 2016. The top runner for 2016 in Google News overall is washingtonpost.com with a low start and 5.51 as their worst visibility in January. But they rapidly make up for it and reach their best visibility with a score of 7.61 percent in April and stay stable on top throughout the rest of the year. First runner up is nytimes.com starting close to washingtonpost.com with a visibility of 5.33 percent in January. They take a hit in June with a score of only 4.04 percent. But after all they reach their full potential in 2016 with their best score of 6.29 percent in December. Usatoday.com stays a steadily strong player over the year with a difference of only 0.80 percent from their best score of 3.55 percent in November to their worst score of 2.75 percent in May. Cnn.com is all over the place in 2016 – while they start off with 3.14 percent visibility in January, they drop to a visibility score of 1.92 percent in March, but getting up to 5.23 percent in May just to spiral down from October onwards to a visibility of 0.85 percent in December – leaving them with the lowest visibility score overall. Also on a rocky road last year is reuters.com. While they start very strong with a visibility of 7.07 in February, they lose continuously since then. They drop under the 3 percent mark in May and still keep sinking. They have 430 headlines in Google News on February 2nd (their best day in February) and 113 in the top stories category with most articles surrounding the Zika virus and oil prices. But on the 25th of December (their worst day of the month) they only have 41 headlines in Google News and 11 in the top stories – with 3 surrounding the earthquake in Chile. 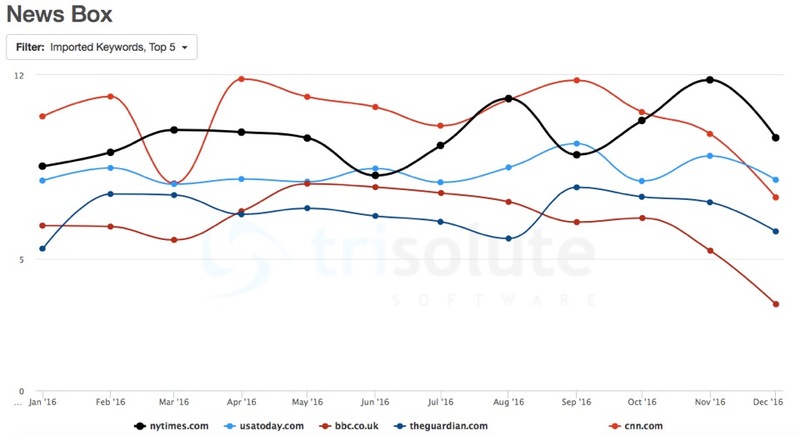 As we are looking at the top 5 in Google News Boxes for desktop it is a probably a bit surprising that we see two new strong international competitors: bbc.co.uk and theguardian.com – while washingtonpost.com and reuters.com drop out of the ranking. Reuters.com still stay in the top 10 though. For most of the year cnn.com is at position one -in April with a top visibility of 11.84 percent and two swings under 8 percent in March and December. Nytimes.com shows us an overall continuously increasing performance – starting with 8.53 in January and reaching 11.81 in November on a clear second place. Usatoday.com again is a steady bronze medalist winner with a range between 7.85 percent and 9.39 percent. On places 4 and 5 we have the mentioned international publishers. Bbc.co.uk reaches their high-point with 7.86 percent in May – just as good as usatoday.com for that month – and their lowest point, after a constant decline at the end of the year, in December with 3.28. While theguardian.com starts off with only 5.40 percent visibility in January, they reach up to 7.73 in October and clearly overtake bbc.co.uk. The general good results of these two publishers are remarkable. As this is an interesting topic we will do a more detailed analysis into the international performance of the BBC and The Guardian in the next months. Yahoo.com starts with a big positive gap and now other publishers are getting closer. For the last classical visibility analysis we are looking at the AMP Carousels for the US in 2016. The relevance of the AMP carousels increases continuously and we started monitoring in May 2016 – so that is where this analysis starts. For the AMP visibility we see a player normally not part of the Top 5: yahoo.com. Washingtonpost.com and nytimes.com also make the cut again, whereas cnn.com is not in the top ranks here. 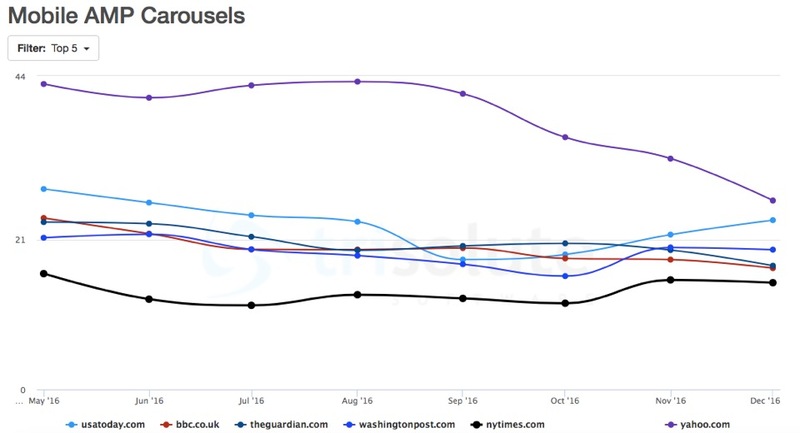 Yahoo.com is very strong in the first measured months, whereas at the end of the year other publishers are catching up to them. While they lead in May with a difference of 15.74 percent to the next player usatoday.com, they are only 2.75 percent ahead of the competition in December. When we look at their best month – their best keyword is “suicide squad” with 2387 AMP ranks in August and in their worst month – their best keyword in December is with 1690 AMP ranks is “kim kardashian”. Players of the tight-knit midfield are: Usatoday.com (top score: 28.13 May; lowest score: 18.22 September), theguardian.com (top score: 23.48 May; 17.37 December), bbc.co.uk (top score: 24.04 May; lowest score: 17.02 December) and washingtonpost.com (top score: 21.28 May; lowest score: 19.61 December). Bringing up the rear is nytimes.com with their top score of 16.25 in May. To round up the analysis for the year 2016 we want to show you the top 50 Google News topics of 2016. We have looked at the Google News Topics that have been picked up most often by our hourly measurement from Google News throughout the year. This shows what the people in the USA were most interested in throughout the year. We have grouped these keywords in our own different categories for clarity as you can see above. The top 5 keywords overall are: donald trump, nasa, zika virus, iphone and google. If you decide to read our other international reviews of 2016, you will see “donald trump” in every top 5 for Google News topics with slightly different positions. Let us now see where our other winning Google News category keywords score in the overall ranking. The sports’ top keyword “golden state warriors” is on place 24, the world’s top keyword “syria” is on place 10 and the entertainment’s top keyword “kanye west” is on place 29 overall. Nytimes.com is a great player in desktop visibility, but still has to catch up a bit in the AMP carousels. Washingtonpost.com is very strong in Google News, good in the AMP Carousels, but has to work on their desktop visibility in the Google News Boxes. 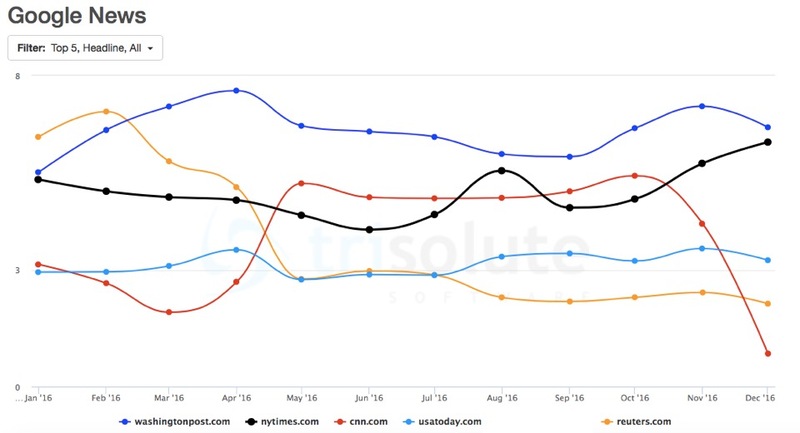 Cnn.com is all over the place and while they remain a strong competitor in desktop visibility, they have to recover from their overall plunge at the end of the year and are not under the top 5 for AMP carousels. Usatoday.com is a steadily good player overall. Reuters.com has to gain their trust back in Google News and has to advance in the mobile and desktop visibility. Bbc.co.uk and theguardian.com could expand their performance in the Google News Boxes for desktop and Google News AMP Carousels. While yahoo.com is strong but declining in the AMP Carousels, their desktop visibility is not at the same level.